This painting has all the elements of the Christian medieval tradition of an allegory of vanity, or the personification of all the temptations and vain pleasures of the world. The painter drew on a wide vocabulary of images to suggest the transience of the material world. In this painting, dressed in fine clothes and bedecked in jewels, the woman seems to be turning away from the mirror, the symbol of vanity. In reality, though, out of the corner of her eye she gazes approvingly at her own reflection. 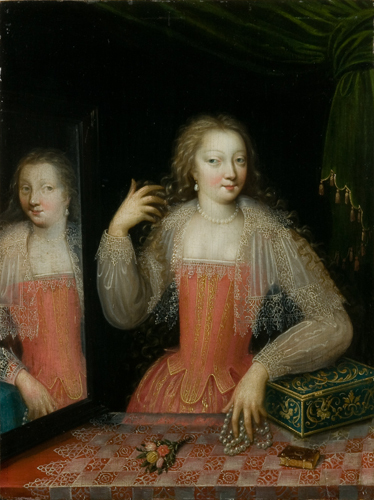 The mirror also represents the idea of false appearances; her jewels symbolize the dangerous allure of wealth. Fresh flowers, beautiful for only a few days, suggest the fleeting nature of beauty; the book on her table refers to earthly rather than spiritual knowledge.